She was born in Sumgait in 1967. She graduated from the State School of Arts named after A. Azimzadeh in 1987. 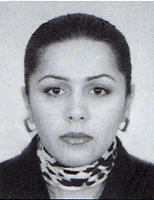 Then she graduated from Azerbaijan State University of Culture and Art in 1994. She is taking a part in the exhibitions held in the Republic and abroad. Since 2005 she is a member of the Azerbaijan Artists Union. She works as a art teacher in Azerbaijan State Art Gymnasia. She participated in a cartoon exhibitions. Since 2006 she is a member of Azerbaijan Cartoonists Union. She is a member of FECO (International Federation of Cartoonist Organizations).